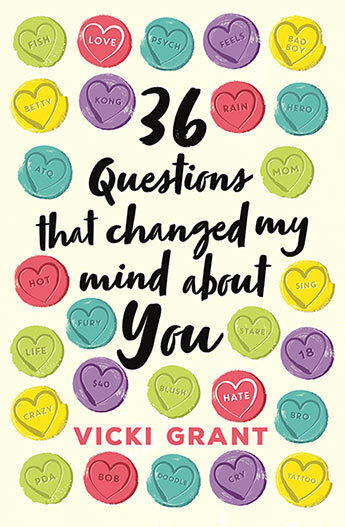 Thanks to Allen and Unwin for sending me a copy of 36 Questions That Changed My Mind About You by Vicki Grant. The copy I was sent didn’t have the final cover but you can buy a copy here! I’m sure most of us have heard about this 36 questions thing. Where if two strangers ask each other these questions and answer honestly, by the end they’ll feel very close to each other. From what I know about it, the two strangers are likely be in love by the end. I knew that this concept in a YA novel would just be so adorable. From the beginning, these two characters were different from each other. Hildy probably put too much pressure on the experiment, whereas Paul only wanted to get paid. It was interesting to learn about these characters the same way they learnt about each other. Little pieces of the puzzle that the reader can add up the same time as the other person. Their questions, answers, conversation and banter were so adorable. Even from the very beginning of this book, I thought that these characters were good for each other. Everything we learn about Hildy and Paul through the course of the novel just made me care about them more. These two people are the reason that I read this book so quickly. I mean, this is a YA contemporary about a study testing whether or not two strangers can fall in love from 36 questions. Of course I assumed that Hildy and Paul would get a happy ending, doesn’t mean I didn’t love reading about it. 36 Questions That Changed My Mind About You is probably one of the sweetest, young adult contemporary novels I’ve ever read.